Should Kiss And Slipknot Members Be Replaced? Billboard hat die Besucherstatsitik von 8 Kiss-Konzerten veröffentlicht. Hier kann man diese nachlesen. Die "Scooby-Doo and Kiss Rock and Roll Mystery" DVD gibt es bei Amazon nun zum Schleuderpreis! BEI AMAZON ERSCHEINT EIN BUCH ÜBER "THE ELDER"
Shock people and throw them for a loop, "Music From The Elder" did. Upon its release in November 1981, the album was confusingly received by both KISS fans and the general public. By the time the calendar turned to 1982, the album was essentially a commercial failure. And KISS were already ready to move on. More than 30 years later, "Music From The Elder" has attained a cult-classic status among a segment of diehard KISS fans. A great part of the album's appeal lies in the mysterious conditions under which it was created. While "Music From The Elder" has been discussed in various music publications and KISS-related books, there has never been a concentrated effort to put this album under a historical microscope. Until now. Through a series of brand-new interviews, original features and related special content, KissFAQ will shine a spotlight on "Music From The Elder" like never before. Ab Mittwoch (27. Juli) steht das neue ROCK HARD in den Läden - mit einem Kiss-Bericht. Infos dazu hier. ERIC SINGER wird bei der New Jersey Kiss Expo im September Special Guest sein! Bei CD Japan gibt es nun auch eine Super Premium Box zu bestellen. Entweder mit Blu Rays oder mit DVDs. Auch die Vinyl-Box kann nun bei Amazon Deutschland bestellt werden, in den USA ist sie jedoch günstiger. ... in Guatemale eine Single aus dem "Killers" Album ausgekoppelt wurde? Die Single "Nowhere to run/Cold Gin" ist momentan auf eBay gelistet. PODCAST ROCK CITY -Episode 114- Back At It! 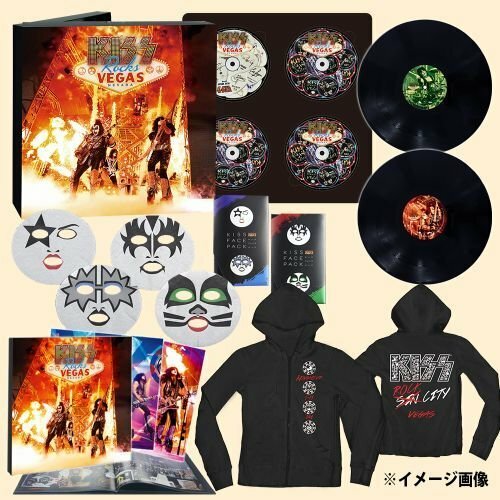 GENE SIMMONS TALKS KISS SPECTACLE - "WE KICKED ALL THE OTHER LIVE ACTS IN THE NUTS AND SAID IT'S NO LONGER ENOUGH JUST TO GET OUT THERE AND THINK YOURE DOING AN AUDIENCE A FAVOR"
KISS FRONTMAN PAUL STANLEY - "SOONER OR LATER, PEOPLE ARE GONNA REALIZE IT'S ABOUT MUSIC"
Ab sofort ist auch eine 2 LP/DVD-Variante von "Kiss Rocks Vegas" bei Amazon erhältlich. Ouch! Gene Simmons Says THIS About Fans With Smartphones! Fri July 29: Bruce Kulick at Rock City Music Co.
ERIC SINGER ON BRANDING AND MARKETING IN MUSIC - "THE BEATLES WERE THE ONES THAT REALLY STARTED IT WITH BEATLEMANIA; IT WAS A LOT LIKE THE KISS ARMY"
Three Sides Of The Coin Podcast #185: Punky Meadows from ANGEL Joins Us & Vinnie Vincent is All His Fault! Kiss sind auf der Titelseite von "The Entertainer Magazine" (Juli 2016). Man kann es hier online lesen.